In weather forecasting, we need both regional and global models. It has become well known, even to the public, that many nations are ahead of the U.S. in global weather forecasting models. I try not to get into too much "inside baseball" on the blog but here is a graph (thank you, Dr. Ryan Maue) that shows the difference between the U.S. global model (red) and the European global model (blue). Higher is better. When I am in a hurry, I will often look at the European model's forecast of the U.S. weather pattern and not even bother with the U.S.'s forecast of the United States. Sad, isn't it? 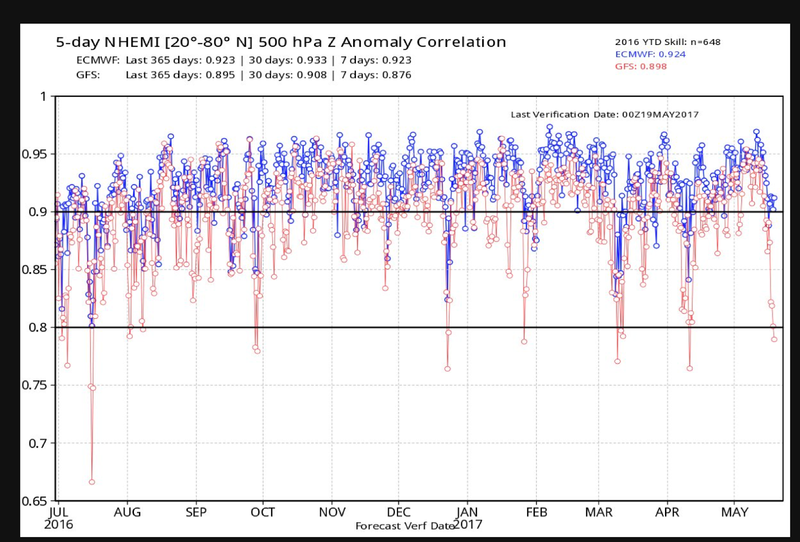 One strategy is to "buy into" the European modeling consortium (ECMWF) and use their global model while the USA concentrates on fine-scale "mesoscale modeling." 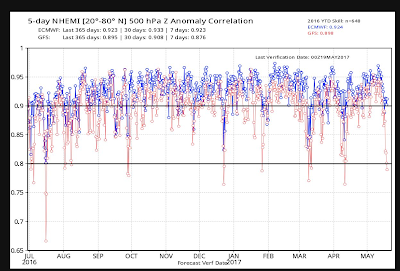 If we try to exceed the ECMWF, it will cost a lot of money and distract us for many years. Act Now. Only 5 Left at Amazon. How Good or Bad Was Yesterday's Tornado Forecast? What Are These Emergency Vehicles Doing? How Did the Forecast Do? Get Off the Golf Course!! Greensburg: The Perfect Storm (Warning)!